Sunset Sands has 72 full service RV sites and 12 unserviced tenting sites. Laundromat and bathroom facilities are centrally located in the RV Park. From mid-June to mid-September, guests have complimentary use of our pool complex which has adult and children's salt water pools. 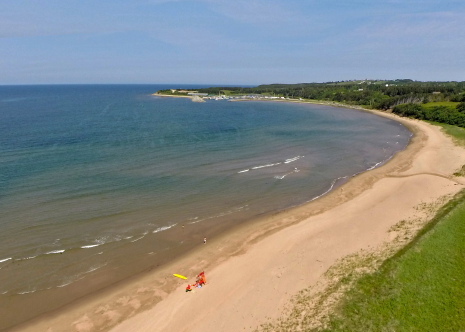 Our greatest natural asset, Port Hood boasts the warmest waters in Eastern Canada with five beaches to choose from, including two within walking distance of Sunset Sands RV Park. Stay with us while you head out on day trips to hear amazing Celtic music at Judique's Celtic Music Interpretive Centre and Mabou’s Red Shoe Pub. You can feast on seafood throughout the camping season, highlighted by Port Hood’s Annual Lobster Picnic and Chestico Days Festival where you can enjoy parades, gaming, golf, and dancing through a fantastic week long celebration. With so much to do and see, we know you're going to love camping at Sunset Sands RV Park! © Copyright – Sunset Sands RV Park – All Rights Reserved.